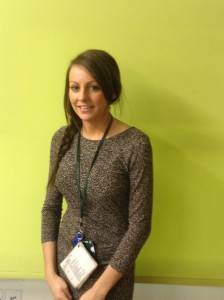 I have a degree in Primary Teaching specialising within the Early Years (3-7 years). I am currently a teacher at Bawtry Mayflower Primary School. This academic year is my fourth year at an admirable school. As a school we were required to complete research following an area of interest. Initially I was hesitant, however I completed the research as that was a school expectation. The impact of action research throughout school has shaped a team of teachers who are well experienced with evidence-informed classroom practice. After engaging in action research I was fortunate to share my research outcomes at a ‘Closing the Gap’ conference at Bishop Grosseteste University in June 2016. As a present-day teacher I am always looking for ways to improve pupils’ experiences and achievements within the classroom. Engaging in action research has enabled me to continue to better myself as well as inspire others beyond my classroom. The goal of this action research was to find ways to improve boys writing within an Early Years classroom (3-7 years). The focus was to improve writing within the role play area. The success of boys writing was monitored within the Garden Centre role play area which was a set-up within the classroom linked to the current class topic. A particular group of boys was not motivated to initiate writing themselves resulting in limited evidence of their capabilities. They chose to work in the same areas daily and were not applying their writing skills learnt through phonics sessions to their play. After researching alternative approaches to an Early Years setting we followed the boys’ lead by setting up a Superhero Rescue Centre. The amount of writing produced was compared between the two role play areas. The amount of writing produced was much higher when the boy’s interests were incorporated in a new instructional approach. The action research has enabled staff to be more willing to take risks allowing superhero play within the classroom as well as being more vigilant to change something quickly when it is not working. Since completion of this action research we have been more flexible in allowing children’s interests to lead their learning. This action research was conducted in the market town of Bawtry on the outskirts of Doncaster. The local features include churches, a theatre, a community library, and many small shops, restaurants and bars. This area has strong links with the Pilgrim Fathers and the school is named after William Bradford’s Mayflower Ship. The school was formed in 1981 and most of the children attending live in Bawtry or the village of Austerfield close by. At the time this project took place the school had 284 children from Nursery through to Year 6. Previous Early Years’ trends within the school and nationally showed girls achieving higher than boys in writing. Whereas girls score above the national average in writing, boys score below the national average. There has been an on-going gender gap since 2013, although the gap is closing gradually. Within the early year’s classroom the role play area is set up linked to the current class topic. After keeping the Garden Centre role play area for 3 weeks we decided that this area was not inspiring the boys to write. Therefore we looked into alternative approaches as an action research project to determine whether a new approach would work better than the past approach. Studies indicated a positive relationship between play and early learning outcomes and that play-based learning approaches improve learning outcomes by approximately three additional months (Education Endowment Foundation, 2015). This suggests that the environment is a significant starting point as it plays a key role in supporting and extending children’s learning and development. Further research from the Primary National Strategy (2007) on Confident, capable and creative: Supporting boys’ achievements research projects indicates planning experiences for boys that build on their interests and value their strengths as active learners and problem solvers. Further, the article suggested utilising boys’ fascinations and learning preferences as starting points for our planning and proposed that using images and ideas from the media could be common starting points in boys’ play. Based on the alternative approaches suggested, I created an approach that incorporated my students’ interests. In this action research, we utilized the Garden Centre role play area to find whether focusing on boys’ interests would help them improve their writing. In this section, observations and interviews conducted prior to the development and implementation of action are summarized, as are descriptions of the new approach developed and participating pupils and their activities. The Garden Centre role play area was set up with the children for the current topic of the half term called, ‘Are Eggs Alive?’ The Garden Centre role play area consisted of gardening materials, till, phone, shopping baskets, dressing up costumes, fiction and non-fiction books, labels, money, a range of writing materials such as plain paper, receipts, seed packet templates, shopping lists, and a range of writing tools. I monitored how often this role play was being chosen and the quality of writing produced particularly by the group of boys who were the focus of interest (focus group, hereafter). Observations during the pre-intervention with a new approach. After keeping the Garden Centre role play area for 3 weeks I observed that this area was not motivating these boys to write. Occasionally the boys would go to the Garden Centre but the majority of their play consisted of boisterous activity in other areas. The group of boys seemed fixated on superhero play in the outdoor area for a long period of time. However, this type of play was not progressing as they ran around and tried to catch each other. As time went on this game was becoming problematic as they were becoming extremely physical and loud. Pupil interviews for providing choices and autonomy for children. As the past approach did not show any progress, I decided to interview with children to understand their wants and interests. While conducting pupil interviews with this group of boys’, they shared their interests and said that they liked to play Batman, Spiderman, Iron man and the Hulk. I asked them what they would like the role play area to be next if they could choose, and as a group they decided they wanted it to be based around superheroes. The specific questions included which areas the children like to work in within the classroom? Do they enjoy working in the Garden Centre role play area? Why? What would they like the role play area to be next? The interviews took place after the Garden Centre role play area was set up, but before the role play area of their choice was established. A new approach based on collaborative decisions among pupils and the teacher. As a small group we planned and created a Superhero Rescue Centre. The Superhero Rescue Centre consisted of superhero books and comics, labels, posters, writing station, television screen, a range of writing materials such as flip chart paper on the floor, paper on a large scale attached to the walls, designing costume templates, explorer packs and a range of writing tools. As I had previously observed, the boys did not want to sit down and write, but much preferred running around outside. I was beginning to identify their interests, learning styles and dispositions toward learning. I considered my observations and some of the ideas I applied within the role play area were providing writing opportunities on a much larger scale, and providing writing bags/boxes so that the boys could move around and did not feel that they had to sit at the table. Within this Early Years setting there were 69 pupils in total (30 boys and 39 girls), with 34 children in Nursery and 35 children in Reception. Boys’ writing was a particular focus as boys were under-achieving in comparison to girls, with a specific focus on a group of boys. During the time period in which the Garden Centre role play area had been set up, as the days went on the number of children choosing to work in the Garden Centre quite quickly declined. In comparison, when the role play area of the group of boy’s choice, the Superhero Rescue Centre, was set up, the number of boys choosing this area was quite high and did not fluctuate as much. I monitored how often the new role play area was being chosen and the quality of writing produced by the focus group of boys. The Superhero Rescue role play area was popular for the length of time, and the boys were in the area daily. On the final day of monitoring the children entering the role play areas, no children entered the Garden Centre all day. However, all 6 focused-group members entered the Superhero Rescue Centre, with 4 in the morning and 2 in the afternoon. Two weeks later this group of boys was still engaging in play which was led by their interests. The findings indicate that the new approach had a positive impact in the boys’ motivation and enthusiasm to write. They were writing superhero stories, designing their own superheroes and writing labels. They were writing on a large-scale hypothetical “emergency,” which superhero they were going to call and how they were going to sort the emergency. Due to the role play area being so popular we expanded and used the table next to the role play area as another opportunity for writing on a large scale. We covered the tables with paper and placed small world superhero characters out as prompts. Planning these experiences for and with boys was built on their interests, fascinations and learning preferences. These boys already had many ideas about superheroes that they wanted to get down on paper and they felt confident writing about a topic of their interest. There was an improvement in their self-confidence as reluctant writers were choosing to write, applying the skills which they had learnt during phonics lessons. After the three weeks of having this role play area much more evidence of writing was available. At the end of the academic year 83% (5 out of 6) of the boys within the focus group achieved expected or above in writing and achieved a good level of development. By taking advantage of the children’s interests I was able to encourage their participation in areas that they had earlier avoided. Although the interest had stemmed from this group of boys it became an experience that all of the children took part in. Even those children with little knowledge of superheroes were developing an interest from their peers around them. When I informally interviewed the focus group of boys about the new role play area, their responses showed enthusiasm, interest and motivation. Some of the responses from the children were that they liked writing on the wall (paper covering the display board to write on a large scale), they liked making superhero story books and that they liked being able to play superheroes in the classroom. Regarding the new role play area in the future, many of the boys within the focus group had specific suggestions, such as they would like a transformer station, a den for superheroes, a hideout or a superhero house. Although I thought that it may be a risk following their interests, the outcome had a positive impact and it was a risk worth taking. All children, particularly the boys, saw a purpose to write and were proud of their writing when they were given choices and autonomy. The boys knew a lot about superheroes, they already had the ideas to write about. They just needed to focus on getting it down on paper. They were motivated and showed much more enthusiasm when they could write about a topic on which they were knowledgeable. The new approach gave them chances to utilise their knowledge base. Children who were generally reluctant to write showed improved attitudes and self-confidence towards writing through play. They were applying those previously learnt skills from small group phonics activities to their play. 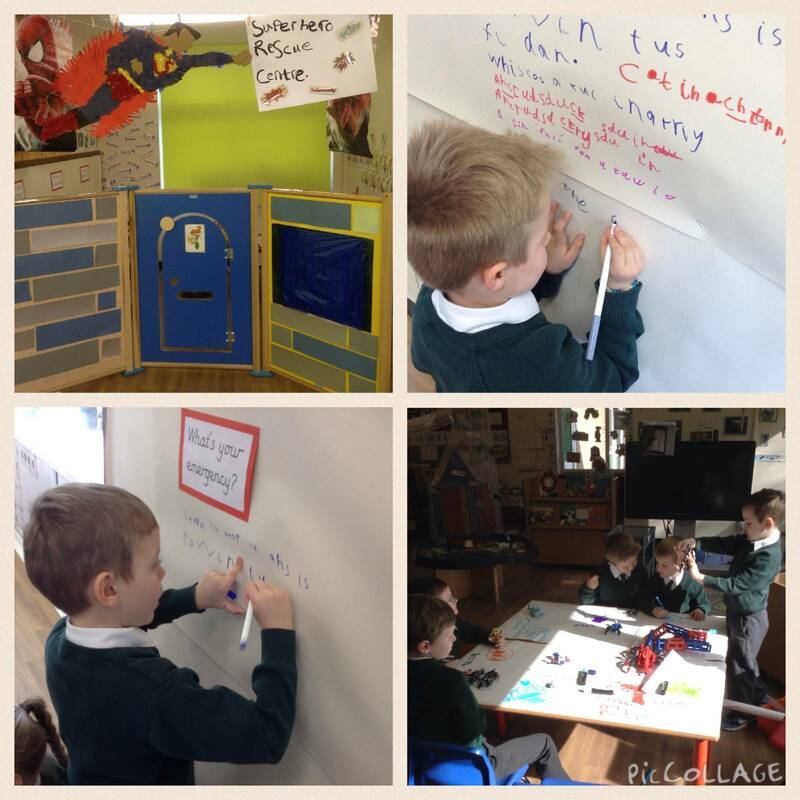 The Superhero Rescue Centre, created by the collaboration between the children and teacher, produced more evidence of independent writing which the boys had initiated themselves. Practitioners within the Early Years setting are much more confident with taking risks allowing superhero play within the classroom. As practitioners we are much more confident to move away from topics and respond creatively to children’s interests. This is something which we will continue to do.